Wow, my 2013 finished with a bang while getting engaged in Guatemala on top of a volcano on Christmas Eve. And 2014 has been incredible as well. As another years passes, it’s fun to reflect on what went down and recalibrate for the future. Here’s a summary of my adventures in 2014. January After leaving Guatemala, it was back to California to spend more time with Amber before her spring semester started. Towards the end of the month, I flew home to celebrate our engagement with our families. February February kicked off my first trip to China for the year. March With spring in full swing in California, it was off to Death Valley for some moto riding at the annual ADVrider rally. This was my first trip to the valley and I was blown away with it’s beauty, remoteness and rugged terrain. The riding was challenging and exciting with lots of soft sand, steep rocky ascents and crashes every now and then. Highlights included Goler Wash, Mengel Pass, the Race Track, Tea Kettle Junction and Lippincott Pass. April This was a crazy month with 2 trips to China. The best part though was a long weekend in Seoul, South Korea on the way home. I met up with a friend of a friend and had a wonderful time exploring the city with my local guide, Claire! It’s amazing how different South Korea is from China and I really enjoyed exploring a new place. The food was delicious, the language was unique and the culture was interesting. I’d love to get back some day and travel more around the country! May Amber and I set off for our annual visit to the the Overland Expo in Arizona where I gave several presentations about riding around the globe on a motorbike. And it was back to New Hampshire for the wedding of my friend, Chip. Additionally, I had been working with a developer for the past few months to build an iPad App. Born from Amber’s creativity, SnapType empowers students to keep up with thier peers, despite their difficulty with handwriting. By allowing them to take pictures of their school worksheets and then fill in the answers using the iPad keyboard they can now complete their work and feel successful. As a final accomplishment for the month, I made my final payment to one of my two groups of student loans. Financial independence seems like a never ending battle, but this was a solid step forward and I’m really excited and proud to be paying off my debt. There’s still a lot more to pay, however with my other group of loans at only a 1.75% interest rate, there’s no big rush to pay them off quickly. June Once again, I hopped on plane and headed west for China trip #4. In order to spice things up a bit, my colleagues took me out to dinner at a unique restaurant where we feasted on giant silk worm grubs, dog meet and french fries covered in liquid sugar… Later in the month I spent a weekend in San Francisco to compete in the Startup Weekend challenge. Startup Weekends are 54-hour events where developers, designers, marketers, product managers and startup enthusiasts come together to share ideas, form teams, build products and launch startups. I joined a group of incredibly talented programmers to develop CrowdSync, a meeting management application to automate note taking. We didn’t win the competition, but it was a fascinating and empowering learning experience. July Halfway through the year, China came calling again. Like April, this was a two-trip month across the Pacific Ocean. With all that air time, my body was tired and so a cupping session was in order. Yes, it was painful. The marks were said to last only 5-10 days but even several weeks later, they could still be seen. I’m not sure if it helped at all but it was a fun new experience! In between China trips I headed to Yosemite with some friends for some camping and hiking while being unplugged. It was just what I needed to recharge! Here’s a picture overlooking Half Dome; We hiked 15 miles that day. Amber also made another trip out to California and we spent time tubing with friends down the Russian River and cycling along the coast. We also took engagement photos along Baker Beach in San Francisco. August In August I officially relaunched the Motorcycle Mexico website. One of my passions/goals is passive income and this was another step towards location independence. Rather than simply pitch the DVDs, I’ve structured a free eBook landing page and an automated email marketing campaign to build rapport with readers before making the sales pitch. Time will tell how well it works. But it’s already proving well with a growing email list and a (small) increase in sales. Of course, it’s a sale I’m proud to make since these DVDs are a gold mine of information where any traveler can reap lots of value. As summer rolled on, Stephen stopped by during his visit back to the USA. He and I rode Baja together in 2010 while he was en route to South America. He made it only as far as Guatemala before falling in love with the country and deciding to live on Lago Atitlan. He’s been there ever since. While in California, we went for a hike in Pinnacles National Park. And no month would be complete without some bicycle riding with my friends – The J’s. September Another annual event, the Horizons Unlimited meet up, had me back on the bike and riding towards Yosemite. I gave several informative and entertaining presentations about motorcycle travel and I watched several other inspirational speakers present on riding in intriguing places like Central Asia, Africa and Cuba. It wasn’t long before China trip #7 came knocking. Here we go again. With fall coming to New England, I flew home to go on a motorcycle ride with my Dad. He’s been a motorcyclists since his college days but hasn’t owned a bike since I was born. Now equipped with a Harley, I too borrowed an HD and we spent the day riding back roads throughout New Hampshire and Vermont. Spending time together doing something we both love was really special and I look forward to more miles in the future! October October was a hell of a month. Action packed and a bit of a blur, I found myself on a new adventure every weekend. The month kicked off with a visit to Colorado to re-unite with friends from college, ride bicycles and drink beer… The next weekend I flew to Utah to catch up with David and Haley. After arriving in Salt Lake City, we headed south for Capitol Reef National Park to go canyoneering through Cassidy Arch and river hiking through some of the country’s most beautiful scenery. Look closely in the photo below… I’m on rappel! The weekend after that I hosted Montanans, Mike and Katie, on a weekend trip to explore sunny California. The trips north to San Francisco and south to Big Sur were a blast and the company was perfect. Other notable October happenings included a visit from my buddy John, hosting my first MotoStays traveler and welcoming my college comrade, Cachaulo to join our company. November With a month full of adventures behind me, there was no stopping the excitement. Reid, Joel, Charlie and I drove 6 hours north for a 3-day 25-mile backpacking trip along the rugged Lost Coast. This was the only stretch of coast in California where it was too rough to build a road. The hike was both challenging and rewarding. Getting caught in the tide with wet feet coupled with walking through soft sand yielded many blisters. Nevertheless, the grandeur of this remote wilderness was well worth the effort. A weekend hiking in Tahoe and a well deserved long Thanksgiving trip home to the east coast made the month of November fly by. December The last page of the calendar also marked my final trip to China. Trip #8 was a success! And of course, to close out the year in style, Amber and I flew down to the Dominican Republic to relax in an all-incluve resort go on a bicycle tour around the north coast of Hispanolia! What went well in 2014? Like in 2013, I flew a bunch. I racked up more than 200,000 frequent flyer miles. I visited two new countries (South Korea and the Dominican Republic) to bring the total country count to 27. My career is going well and I’m providing value to my company and my clients. The work is challenging at times but also rewarding with many benefits and I enjoy the people I work with. Amber and I created the SnapType iPad app to help students with dysgraphia (and the feedback we’ve received from teachers, therapists and parents has been overwhelmingly positive). We’re also working on upgrades for version 2.0 to make it even better! What did not go well in 2014? Even though I had many wonderful small adventures, I didn’t undertake a large journey. When I rode to Argentina a few years ago, people told me it was a “once in lifetime experience” and ever since I’ve hoped it would mark only the start of a life full of adventures. It’s tough to undertake large quests when burdened by the responsibilities of daily life. Nevertheless, I look forward to putting myself in the position to take advantage of more opportunities in the future. Year after year I continue to struggle with back pain. As an engineer, it’s most frustrating to be unable to find a root cause of the pain and a solution to resolve it. The challenge is beyond physical and I struggle emotionally with not being able to live an energetic life filled with freedom and motion. Even though it was a fun year, I didn’t take the time to write anything on the blog. I had to make a commitment to myself to write this year in review (albeit a little late). I find it important to reflect on and celebrate the past to help prepare me for the future. Even though I went home to New England a few times, I still wish I spent more time with my friends and family on the east coast. Looking Ahead There is a lot in store for 2015 and it’s already shaping up to be a busy year with my first trip to China scheduled later this January. But most of the year will be focused on this fall, when Amber and I get married. Even though we’re keeping things simple, there is so much to do. We want to put on a great event and look forward to celebrating with all of our friends and family. Chris Guillebeau writes about The Happiness of Pursuit in his new book. He talks about how taking on a quest can improve your life. I’ve had this sensation many times in my life. When I was riding to Argentina, and producing the Motorcycle Mexico DVDs, and cycling a century, and working out a new climbing route, and building a mobile app – All of these quests were not relaxing. I was engaged, in flow, and working my mind and body. That’s happiness – Not in reaching the goal, but in the challenge to reach the goal. I want to bring more of this into my life. It makes me feel alive and excited! I have a few small quests in the works for 2015 and I look forward to larger quests sometime down the road. What about you? How was your 2014? Are you happier now than you were the same time last year? Have you made progress on your personal goals? What went well for you this year? What could have gone better? 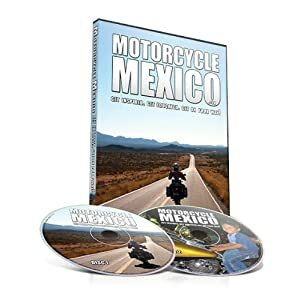 -:- Motorcycle Mexico DVD -:- The how-to guide with everything you need to know about motorcycling in Mexico. All presentations are free, open to the public and at the local library (unless noted otherwise). Please contact me if you'd like me to present to your group!